Last weekend we had a beautiful Father’s Day at the Montelucia Resort in Paradise Valley. Auntie Heather got the family a room near the pool so we could take breaks from the 105 degree heat! Sean got to spend his first Father’s Day as a daddy swimming with Reesa and lounging by the pool with the rest of the family. Reesa got to try out her new Sponge Bob raft and cute pink life vest. Swimming is quickly becoming one of Reesa’s favorite activities!! Over the last couple of weeks we've had the opportunity to do some fun summer activities with Reesa. Ari, Melissa and Asher Spiro had us up to their beautiful home in Flagstaff. It was a wonderful reprieve from the triple-digit heat of the Phoenix area. We went to an outdoor festival held at a park in downtown Flagstaff. Reesa was able to lay in the grass and breathe the fresh mountain air while watching all sorts of interesting people dressed in funny costumes. Reesa even got to share a snow cone with mommy! After the festival mommy and daddy played in a golf tournament with Ari and Melissa at their club in Pine Canyon. The cool weather and majestic views were just what we needed. It was a beautiful weekend for all! The next weekend, Mark, Jenny and Olivia Ruble had us over to their house for a swim party. It was the first time Reesa had been swimming since her g- tube surgery 2 months ago. Reesa had lots of fun floating with mommy and soaking up some rays. She was so relaxed that she fell asleep in her raft! After swimming we ate sandwiches and watermelon while we played with the babies and dogs in the backyard. 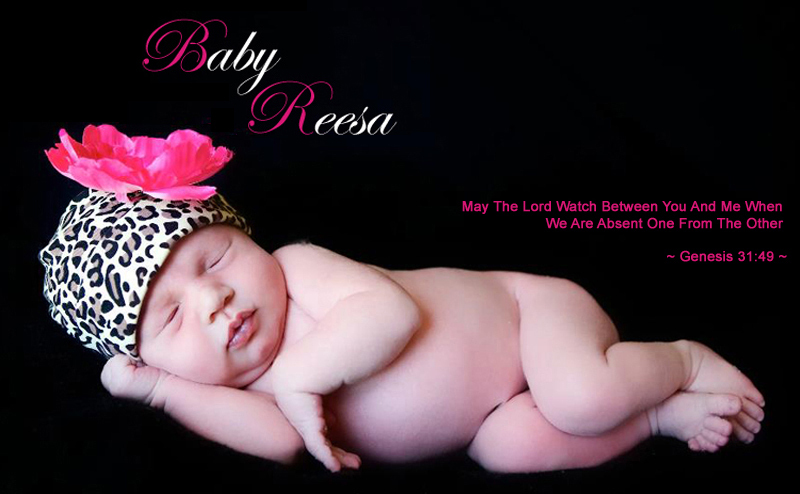 It is amazing how much more we appreciate the simple things in life like a summer pool party...thanks to baby Reesa. In the last couple of weeks Reesa’s disposition has changed quite a bit. We knew this would happen as the disease progressed but the reality of the situation has made us all sad and fearful for what the future holds. Just a few weeks ago Reesa could track objects and people from across the room. She would turn her head and look if you made a noise. She seems to have lost this ability as she just stares into space and won’t/can’t follow you with her eyes. Reesa is also slowly losing her ability to laugh and smile. As late as a month ago she would laugh loudly at almost anything and always had a big smile on her face. Now her laughs are rare and have dwindled to tiny growls and her smiles are fading. It’s amazing how much even the slightest smile can brighten our day. Reesa’s saliva secretions have been increasing as well. Due to the risk of aspiration (pneumonia) we have to use a suction machine to clean out her mouth 5-10 times per hour. We can no longer leave Reesa in the car seat without someone sitting in the back with her. While in this position she needs to be suctioned frequently or she starts to choke on her saliva. Despite these latest developments, with some adjustments to her medication, Reesa has been comfortable and happy.